Affiliation agreements that do not meet each of the nine required elements of Standard 1 remain a frequently cited cause for marginal non-compliance. There has been considerable attention to this issue from multiple members of RCAP who have periodically published guidance for program directors facing this problem. NAACLS Board of Directors members encourage flexibility and a broader interpretation of Standard 1 by committee members in this litigation prone era of healthcare. At the same time, we must ensure that the intent of each general and specific item required within Standard 1 is fulfilled by the affiliation agreements for the ultimate protection of both our students. Historically, navigating a successful new affiliation agreement with a federal facility, such as a Department of Veterans Affairs hospital, results in an additional level of complexity, due to federal supremacy regulations and limited authority to addend a nationally developed agreement. There is good news for program directors still struggling with how to approach VA affiliation agreements. RCAP members recently reviewed VA standardized form 10-0094g (Associated Health Education Affiliation Agreement between the Department of Veterans Affairs [VA] and an Educational Program) in conjunction with other applicable VHA documents and developed a crosswalk annotating how the VA fulfills the intent of all nine elements within Standard 1. Addenda for VA affiliation agreements ….. are no longer needed! 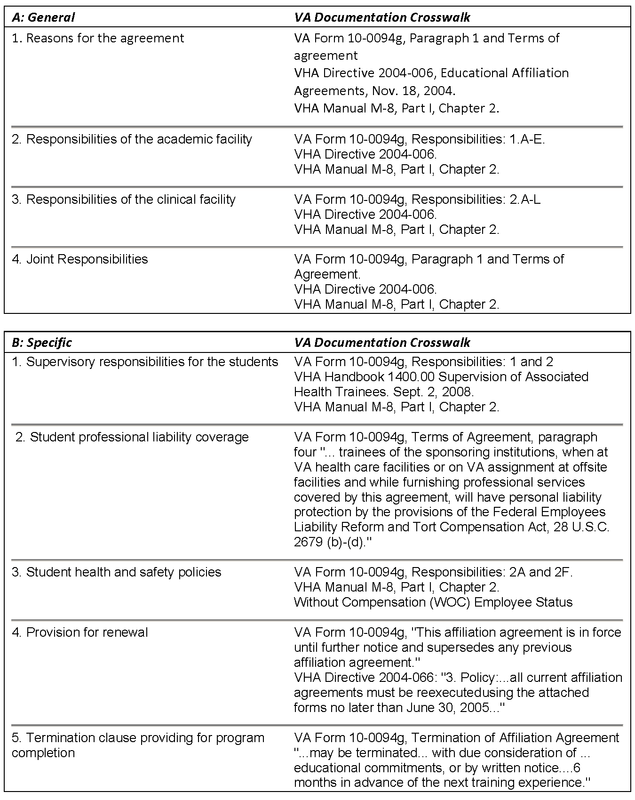 For more information regarding VA Form 10-0094g and other education related VA documents, visit the VA Office of Academic Affairs internet website.